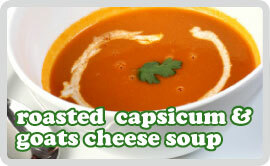 I used to buy a very expensive version of this soup for my lunch once a week. The extraordinary prices were baffling once I worked out how easy and relatively cheap it was to produce myself. Needless to say I no longer buy the rip off version. Cut the capsicums in half, remove the seeds and stalk and place on a baking sheet, drizzle with 2 tablespoons olive oil. Roast in the oven for 30 minutes. Cool slightly then remove the skins and discard. Chop the capsicum and set aside. Heat 2 tablespoons olive oil in a large deep pan over a medium heat and fry the onions for 5 minutes until golden brown. Add the garlic, cumin, thyme, bay leaf and salt and continue frying for about 1 minute. Add the capsicum and then the stock. Bring slowly to the boil then reduce the heat to very low. Pop on a lid and simmer gently for 1 hour, stirring occassionally. Remove from the heat and fish out the bay leaf. Then with hand blender, blend until smooth. Add more hot water if the soup is too thick. Stir in the goats cheese and season with salt & pepper to your taste. This soup is great reheated but doesn’t stay fresh for more than a couple of days as the cheese gets a bit whiffy. Sprinkled with parsley or fresh thyme and a little swirl of creme fraiche for a flourish of gayness.